In this short treatise on Sikh Ethics, the Adi Granth has been taken as the basic and main sourcebook of the Sikh moral-code. The path of life enunciated by the Sikh Gurus is the path of self-realisation or perfectionism; it is neither self-gratifica­tion or hedonism nor self-denial or rationalism. 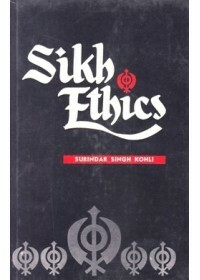 Emphasis 'in Sikh Ethics is laid on the practice of godly qualities. Their observance makes a human being godlike. The field of the body is to be cultivated for truthful life and spiritual advancement. All the senses are to be harnessed properly and the virtues of body, speech and mind are to be inculcated. The discipline enunci­ated by the Sikh Gurus is a universal discipline and requires the discipline to perform his worldly duties alongwith his spiritual progress; he has not to become a one-sided personality. He has to remain alert on all the three planes, i.e., physical, mental and spiritual. The SikhEthic», in practice, brings before us an ideal person, thoroughly balanced in physical, mental and spiritual cultures. Whereas he works as a healthy constituent of society, he also rises to spiritual zenith. In him, we find, an exact combination of action, knowledge and devotion. Dr. S.S. Kohli, retired as Professor and Head of the Department of Panjabi, Panjab University, Chandigarh is an eminent writer, a critic and authority on Sikh literature. He has done a distinct service to the realm of Comparative Religion in general and Sikhism in particular by his works which are marked by clarity, brevity and sound scholarship.